The first step in tackling this sort of project is knowing exactly what you are going to make and having precise measurements of what goes where. Yes, with some types of off-centre turning you can wing/freestyle it to create off-centre stems and body shape forms etc. which is very skillful in itself, but as with this platter and similar projects, some things need to be in very specific places. 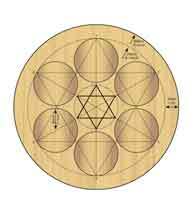 As such, a scaled or full-size drawing - as opposite - is required here. 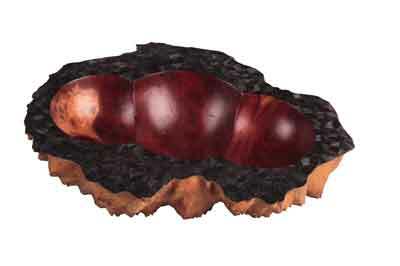 Ensure to prepare the timber you are about to use accurately and cleanly. The more accurate you are in your preparation and turning, the less you will have to make adjustments later on. Many pieces will require the front and back to be turned and much of the initial work can be done on standard chucks, faceplates, between centres and glue chucks. I use a combination of all of these, as necessary. But in the case of this piece I used a between centres method for turning the underside, inclusive of a spigot to hold the work in a chuck later and on that a small spigot which is used to centralise the piece in the next stage. 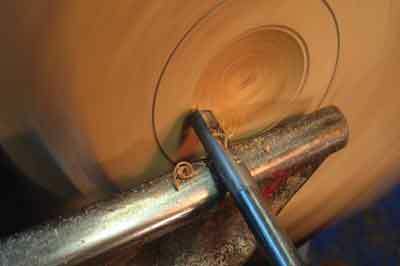 Also, check the lathe is stable, and on a good solid base before you start the project. Remember I mentioned that the work is out of balance? Everything needs to be properly secure and as well constructed as possible in order to minimise vibration. 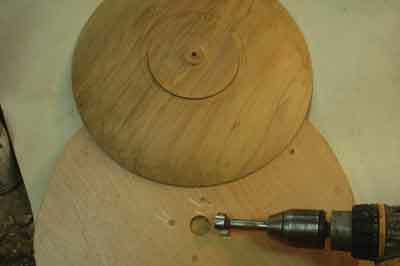 Remount the wood by the spigot in a chuck, cut and completely sand the top surface. 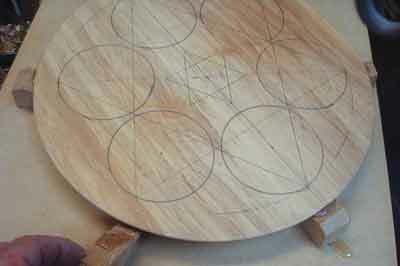 Once this is done, transfer/mark all the offset designs onto the piece. Sit the now finished back of the plate - apart from tidying up the spigot and foot later - onto what I call a slide, or a piece of MDF. I left the small spigot that was where the live centre was against the bottom. 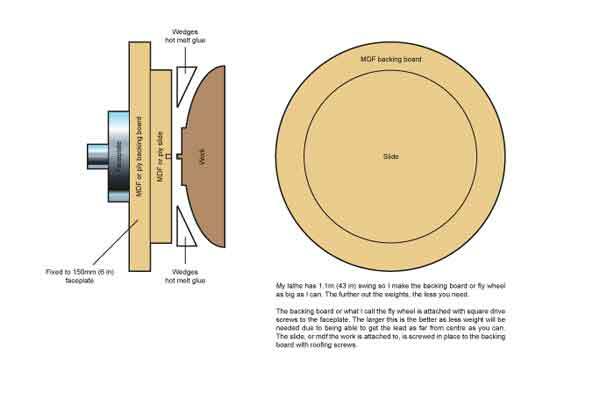 Drilling a hole of the same size in the MDF helps centralise the plate on the slide and also gives it some support against the centrifugal force. Using hot melt glue, firstly add glue to the foot. If you are having trouble getting the plate stuck before the glue goes off, load the spigot and then re-heat the glue with a heat gun until an even melt is achieved. Glue the plate on by its base then level it up with wedges and more hot melt glue. I used two sticks of glue to hold this plate in place. Seat the piece flat and use a steel rule to measure around the plate rim back down to the MDF, to check that it is level. 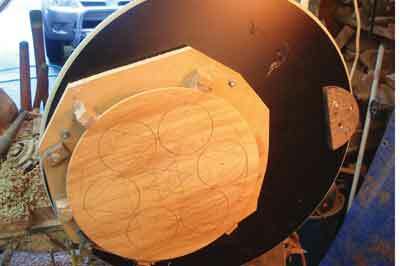 Next, make what I call the flywheel or backing board, attached to a good, big faceplate. Use MDF - or ply is better as it doesn't flex as much - and the slide holding screws (40mm roofing screws) grip better in ply and don't form a bump as they do when removed from MDF. 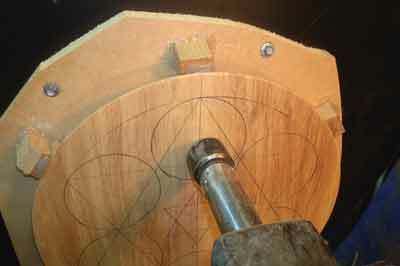 I usually make these flywheels as large a diameter as my lathe will spin. They can be used again for other projects. The extra size also makes weight attachment easier. Make sure this flywheel runs perfectly true. Hold or lightly clamp the slide, with plate attached, to the flywheel. Bring up the tailstock onto one of the bowl centres. Mount the slide securely to the flywheel with at least four 6 x 40mm (1/4 x 1 5/8in) screws. Normal screws can just shear off but the Tek screws can be used many times over. The work will naturally hang heavy-side down. Add counter-balance using lead - flat sinkers work well - until you can rotate the work and it stays stopped without support anywhere around 360 degrees. The further away from the workpiece you can place the counter weight, the less lead you will need. This sometimes takes longer to get the balance right than does the turning, but the effort is well worth it. After a while you gain a sixth sense as to where and what weight to add to balance the off-centre slide. 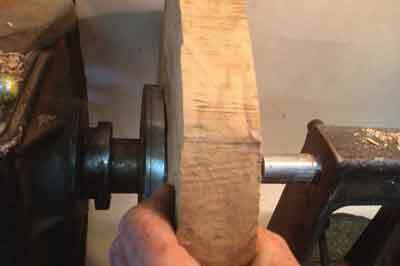 If you do not get this right the first time, just start again, as the time spent makes the work not only easier to turn if balanced, but less stress is placed on your lathe. It is important to make sure all aspects of any off-centre holding device and work is secure and stable before you start turning the project. So whatever method you use to hold, make sure the necessary holding device is secure and holds the work in place. Make sure that everything is securely fixed and no unnecessary pieces are sticking out that can catch you as the piece is rotating. Once the piece is secure and in the position you need it to be in, rotate the work by hand before you start to turn to make sure everything is clear of the lathe and the toolrest. Never adjust the rest whilst the work is rotating and make sure you keep all body parts absolutely clear of the spinning work. Vibration is a killer no matter what kind of piece is being turned. I have already mentioned needing a sturdy base for the lathe, but another factor that will help is a wide variety of speeds. Variable- speed control is very handy with this type of work, as the micro adjustments in speed help no end with minimising vibration. It isn't, however, totally necessary - just start at a low speed and adjust upwards until you can make a clean cut safely with minimum vibration occurring. The more out-of-balance the work, the more adjustment is likely to be necessary to find that sweet spot. You have spent a lot of time marking out and making sure everything is secure, so take time to measure as you go along, too. In this case, the hollows need to be an even depth. To that end I cut a jig that doubles up as a depth-gauge shaped template so all the bowls are exactly the same - well near enough anyway. 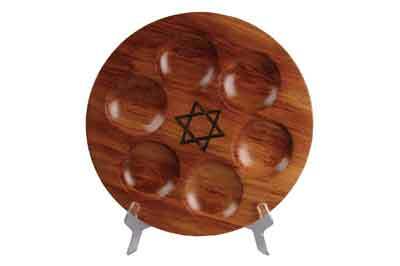 Remember that four legs of a table cannot all be seen at once. Depending on what you are off-centre turning it is highly likely that you cannot effectively back track to sand the pieces once the location of the work has changed. It is far easier to sand each section turned to its finished state before you move on to the next phase. With this piece there is a certain amount of repetition, repositioning the piece each time requires care and careful checking for security of fixing. 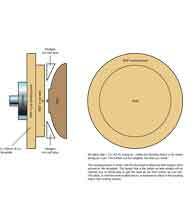 Continue around the piece by removing the slide from the flywheel, aligning with the tailstock, and re-balancing for each of the six bowls. I normally work around the piece in a clockwise fashion, probably as I am right-handed, but it doesn't really matter which way you work. 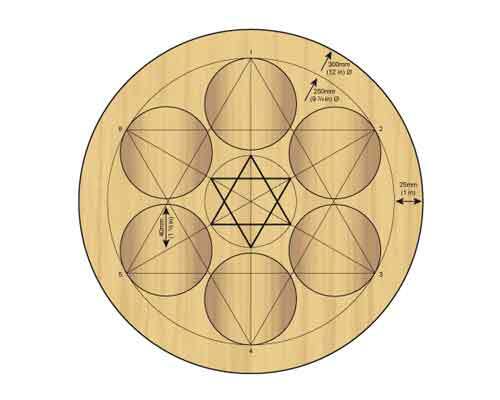 Do not become complacent; the work is still off-centre and you need to be careful here. 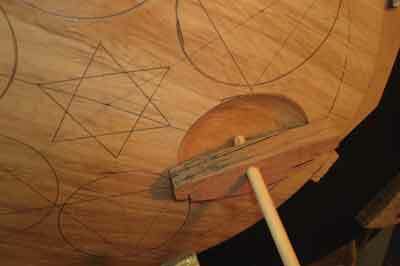 Once all the off-centre aspects have been turned, re-centre to the original position and gently sand the main top surface that is left. 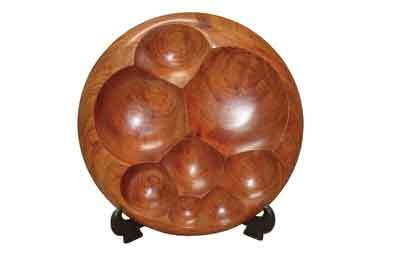 This is best completed with the lathe stationary using a large diameter orbital sander. This helps to clean up any errant fibres and cleans off the top face of the piece nicely. Make sure you don't soften or blur the boundaries between the face and the off-set turned hollows you have previously made. Finishing is a very personal thing, although as this piece is functional, this has a bearing on what finish you decide to use. Any suitable product you deem suitable can be used. But for this platter, I used three coats of lacquer as food will probably be sitting in it for long periods. I find oil finishes can stain or leave white marks if something hot sits on the item. In a gallery situation, oils dull off under overhead lighting and I hate comebacks. If a lacquer piece returns, I give a lifetime warranty on the finish - I don't know if that is the life of the bowl or mine - all that is required is a light sand and to spray another coat onto the piece. The lacquer bonds on as it has natural drying agents. 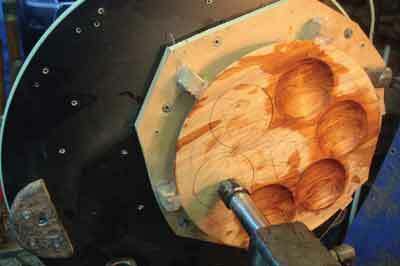 If you so choose, you can alter the parameters of where the cuts can occur and create something like this bowl. 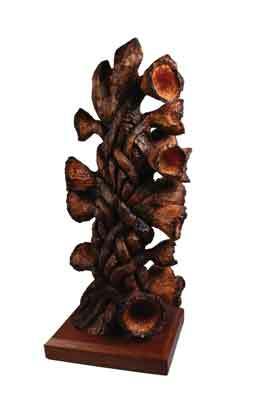 The designs are only limited by your imagination and what off-set you can have on your lathe. I have also turned a number of other projects using the off-centre slide. I actually use this for turning quite a few of my pieces and find that this ingenious device offers me many options.